Of the 175+ aquatic invasive species and non-indigenous aquatic species with resident populations in the Great Lakes, about 41% of them are animals, ranging from the very damaging sea lamprey to zooplankton such as the fishhook waterflea and such sought after introduced game fish as the mighty Chinook salmon, and a handful of insects. One of the most notorious aquatic invasive animals since the 1980s has been zebra mussels (Dreissena polymorpha) and quagga mussels (D. bugensis). They were introduced into the Great Lakes in the mid- to late-1980s from freshwater ballast discharged from freighters originating in the Black and Caspian Sea region of eastern Europe and western Asia. They were first sighted in Lake St. Clair in 1988. The mussels filter huge volumes of water in order to feed on plankton, (microscopic plant and animal life) which forms the base of the aquatic food chain and bacteria. This removal of plankton from the lakes has created a dramatic increase in water clarity. Although the clearer lake water is seen as an aesthetic benefit to some, the loss of nutrients it represents significantly reduces the available food for fish and other organisms. Zebra and quagga mussels biofouler such solid underwater substrate as rocks, piers, intake pipes, and boat hulls by attaching with using tough elastic strands called byssal threads. In addition to the ecological damage caused by zebra and quagga mussels, hundreds of millions of dollars have been spent to clean up fouled pipes and keep the mussels from fouling drinking water treatment, industrial and power plant intakes. The mussels have spread beyond the Great Lakes into 22 states and 2 Canadian Provinces (pdf). MacNeill, D.B., Domske, H.M. 2011. New York Sea Grant Fact Sheet. New York Sea Grant Extension Program, Oswego and Buffalo, NY. 4pp. A possible invasion into the Great Lakes of several of the seven species of carp found in North America, but not in the Great Lakes – the silver and bighead carp (known collectively as Asian carp) – has raised concerns. D MacNeill, M Snyder, K Schultz and J Makarewicz. 2004. 4 pp. The "fishhook waterflea" (Cercopagis pengoi), a predatory zooplanktor which preys on smaller zooplankton, has invaded Lake Ontario and six of New York's Finger Lakes. This species of invasive animal can easily be spread on fishing gear and fisheries sampling equipment. This 4 page fact sheet gives an overview of the species' biology and life cycle, its invasiveness, and recommendations on methods to prevent it wider spread throughout North American water bodies. Zebra mussels can foul any type of water intake pipe, from the largest city drinking water treatment plant or nuclear power station to a fire company's dry hydrant on a river or lake or even their pumping trucks' draught hoses. This 4 page factsheet presents what fire control professionals need to know about keep the water flowing when it is most needed - while fighting a fire. This 2 page brochure gives boaters, anglers, and other recreators and interested individuals tips on preventing the spread of zebra and quagga mussels when transporting boats, personal water recreation vessels, and fishing gear from waterbody to waterbody. This 2 page factsheet is a distillation of the longer North American Invader factsheet, set in a simple question & answer format. While most people think of zebra mussels fouling drinking water treatment plant and power plant intake pipes, they can cause just as significant problems when drawn into residential water pipes which use freshwater lakes and rivers as water sources. This 11 page factsheet explains various methods of preventing the task of removing mussels from the pipes inside your walls. This 8 page factsheet addresses in a general way the Great Lakes invasive species issue and then presents information on several important Great Lakes AIS, including: zebra mussels, spiny and fishhook waterfleas, sea lamprey, alewife, common carp, round gobies, purple loosestrife, water chestnut and Eurasian watermilfoil. 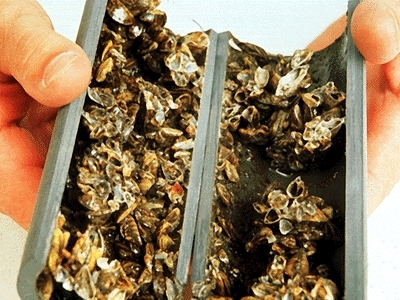 This factsheet discusses the origin of the zebra mussel in North America, the mussel's biology, predation on the mussel by native species, biological and infrastructure impacts of the mussels, and management and control alternatives. A list of references is also provided. Although the factsheet is now 15 years old, the information contained is still accurate; the factsheet also contains a range map accurate to August 2006. D Oleson. 2007. 5 pp. The non-native vertebrate Bloody Red Mysid shrimp (Hemimysis anomala) has been found in the Great Lakes. A bibliography of scientific papers on this species has been prepared by the National Aquatic Nuisance Species Clearinghouse.